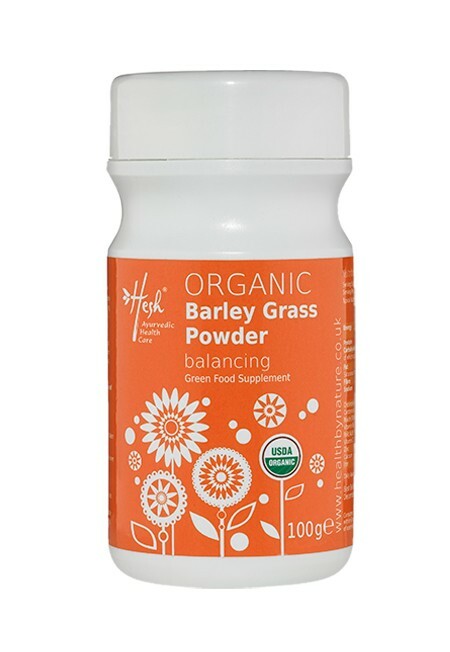 Organic Wheat grass (Triticum Aestivum), Organic Alfalfa (Medicago Sativa),Organic Barley Grass (Hordeum Vulgare), Organic Spirullina (Arthrospira Platensis), Sesame Seeds (Sesamum Indicum), Flax Seeds , Sunflower Seeds, (Helianthus Annuus), Tulsi Powder /Holy Basil(Ocimum Sanctum), Ashwagandha Powder (Withania Somnifera), Turmeric (Cucuma Longa), Amla Powder (Emblica Officinalis), Pippali (Pipper Longum), Methi /Fenugreek (Trigonella Foenum) , Ajma (Trachyspermum Ammi). 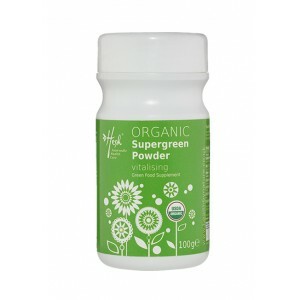 Supergreen is a unique collection of fourteen renowned Ayurvedic herbs, including ashwaghanda, tulsi (holy basil), sesame, flax and ajwain. Star ingredient aswagandha, known as 'Indian Ginseng', supports concentration and wellbeing, working in synergy with vitamin C-rich amla and digestive aids, methi seed and ajwain. Known for their rejuvenating, replenishing and vitality-boosting properties, our supergreen mix boasts a high level of chlorophyll, known as 'liquid sunshine', an alkaline ingredient and bioactive source of magnesium to support you on your quest for energy, vitality, and inner radiance. Our holistic supplement is 100% raw, pure and natural, and free-from any GM ingredients or artificial preservatives. Organically grown to ensure a premium, ecologically-farmed green food supplement. 1 spoon (3.5g ) to be added to water, juice, smoothies or spinkles over cereals.